18th Street South between South Clark-Bell Street and Crystal Drive, adjacent to the Crystal City Metrorail Station. This project will be phased to accommodate future development along 18th Street South. 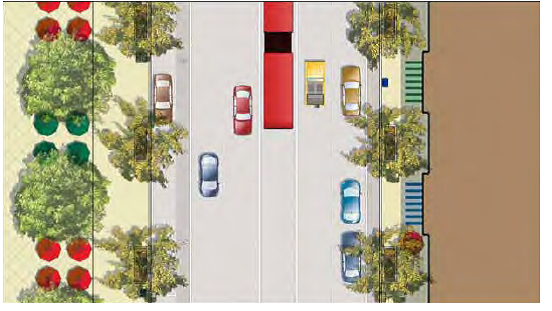 The first phase of the realignment will change the location of the north side of 18th Street west of the mid-block loading dock to accommodate a wider sidewalk and on-street uses detailed below. The streetscape on the south side of 18th Street South will be replaced and upgraded as part of a private development. The final phase will complete the north side realignment and will be coordinated with future development. The purpose of this project is to complete the new alignment of 18th Street South and improve multimodal connectivity to the Crystal City Metrorail Station. The 18th Street South Realignment project is a goal of both the Crystal City Sector Plan and Crystal City Multimodal Transportation Study.